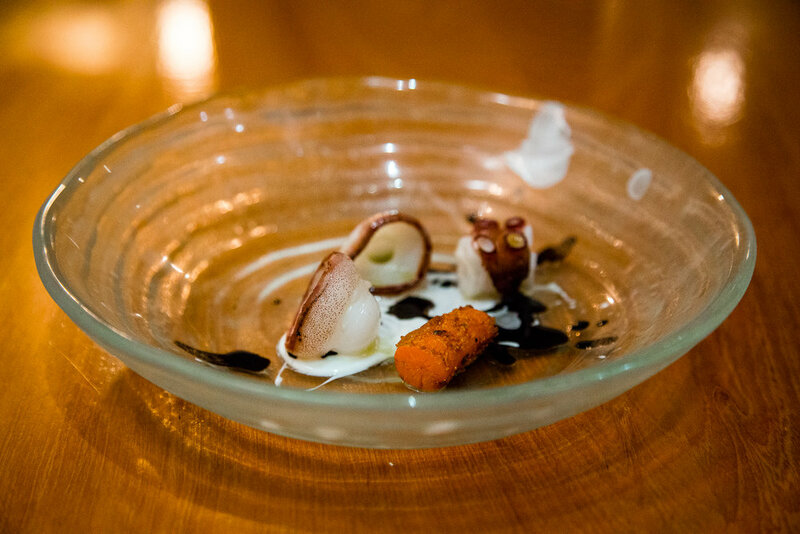 My dining experience at Atelier Crenn was my favorite during my visit to San Francisco and the Bay Area. But as I reflect further, I'm not sure what else to say, my memories being a muddled mix of exultation and embarrassment. The meal was brilliant, the artistry unparalleled, and Dominique Crenn herself made a surprise visit mid-evening. Mentally and emotionally unprepared, my inner fangirl ran unleashed, and I babbled manically, peaked on panic and amazement. The following day, I repeated this experience when I attended her book signing at Omnivore. Or rather, I would have attended her book signing had I, an idiot, known that it would involve more than the signing of books and not arrived halfway through the hour-long Q&A. Forced to sit outside until the end like a school kid-forgotten, I eventually straggled in, brimming with shame and disappointment. Yet, she was ever gracious and humble, which filled my respect meter to overflowing and once again activated cringe fangirl mode. Awkwardness aside, the meal starts off with a poem that Dominique Crenn writes for each evening and on which the menu is based. In my case, it was a beautiful free-form verse about the sea, which was presented alongside a complimentary glass of champagne. And then, it begins. I am no stranger to artistic plating, but some of the dishes that followed were so ridiculously stunning that they transcended artistic to art, but without any sacrifice in taste. It was a delicious and extraordinarily beautiful meal, making for an especially memorable experience. 'Cinderella' Pumpkin Purée, Shaved White Truffle, Hokkaido Uni presented tableside with a truffle butter sauce. The uni was brought out within a hollowed out, whole pumpkin. Grilled Sunchoke, Coffee Glaze, Turnip. Yuzu, Mountain Spinach, Elderberry Glaze?